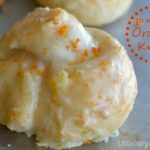 This Christmas Pastries Post has been sponsored by Rhodes Rolls! As always all thoughts and opinions are my own! 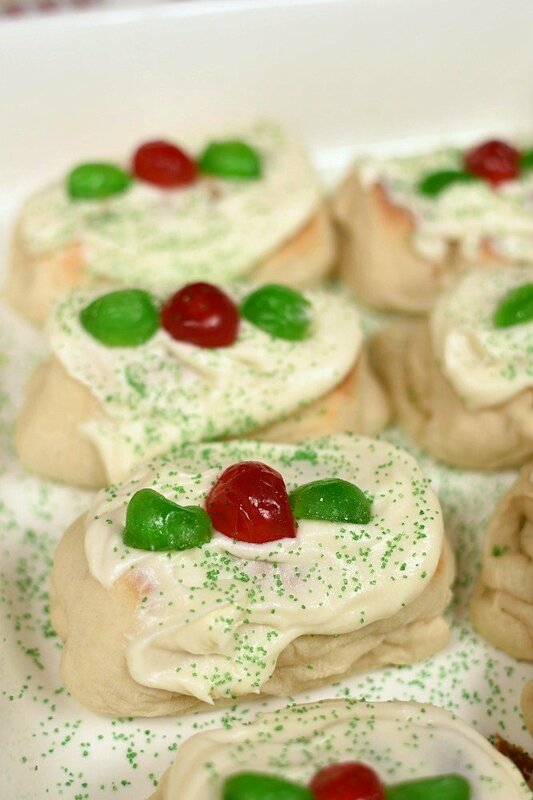 Christmas Pastries are not only the prettiest little holiday sweet roll but they also taste exactly what Christmas should taste like! 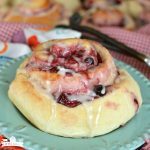 It’s hard to decide if the best part is the icing and cherries on top, or the yummy surprise inside! I guess it doesn’t really matter because you’re going to eat the whole thing anyway! 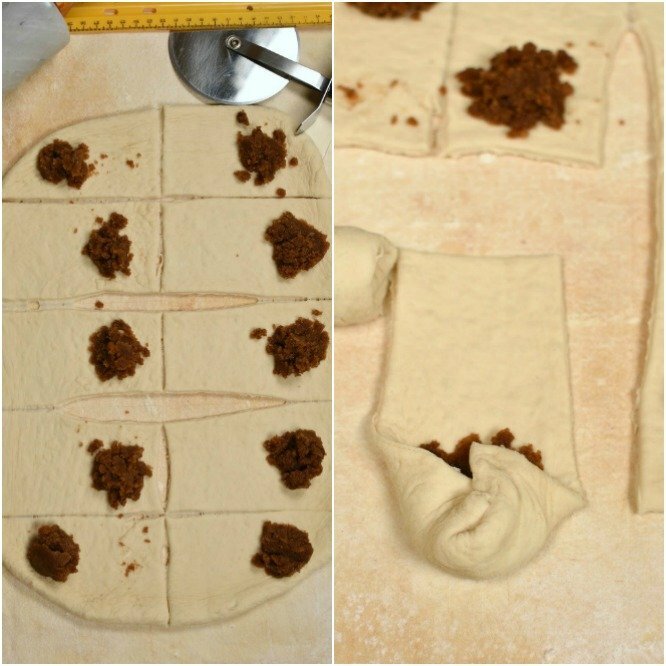 Eat the rest of the Christmas Pastry first and save your favorite part for last? You head straight to the good stuff and devour that filling then move on to the rest of the pastry? I’m definitely in the save it for last camp! In fact, I’m so into the save it camp that I save my favorite clothes for a special occasion and don’t wear them for normal days so they don’t get stained! Then one day I look in the closet and they are completely out of style and I didn’t even wear them! Maybe I just need more clothes so I don’t feel like I need to save them! There are a few really cute hand towels that are only for certain uses. They are for hanging on the oven, and for covering rising bread dough, or for holidays. No one is allowed to actually use them to dry their hands. That’s off limits! When it comes to saving my candy I’m the worst! I actually have a few years of candy from my Christmas stocking in the back of my underwear drawer! My boys never look in there so it’s a completely safe hiding spot! And you know what, please don’t tell them! If they happen to find out about it they will probably go root to the bottom of my undies and devour my candy and they’ll probably break their teeth doing it! Okay, you are here because you want to talk about Christmas Pastries right? Let’s talk about Christmas Pastries then! My mom made a homemade version of these every year when I was growing up. It was tradition. Still is! My kids can’t stand the thought of only getting them once a year and I just don’t have time to make them from scratch more often than that. 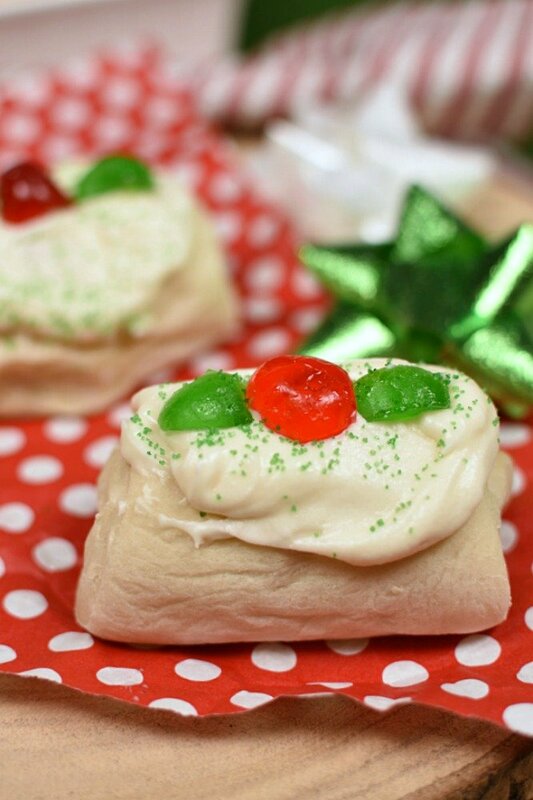 So I created this quick and easy, semi homemade version of Christmas Pastries. They begin with a loaf of Rhodes frozen bread. See why this is so easy? I like to stick the loaf in the freezer and let it start to do it’s thing overnight. The next day all I have to do is roll the dough out and assemble the pastries.Let me show you how it works! 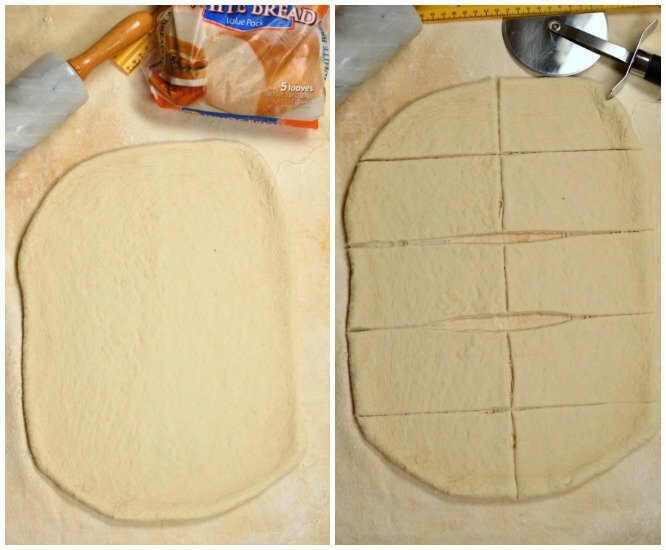 Roll the dough into a rectangle that’s as close to 12 x 18 inches as you can get it. It’s hard to make it exactly even and that’s okay. Try to roll it until the thickness is pretty even if you can. If the dough is different thicknesses you will end up with different sized pastries which my mom wouldn’t have ever allowed. But you know they eat the same! Cut the dough 6 x 3 inch squares. So basically in half lengthwise then in 3 inch strips. 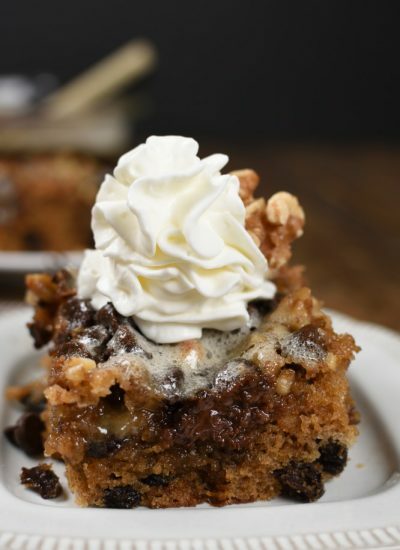 Mix butter, brown sugar, cinnamon, and caramel pudding mix together. Divide and set on one end of each rectangle in a little mound. Pull the edges of the rectangle over the brown sugar mixture tucking it inside. 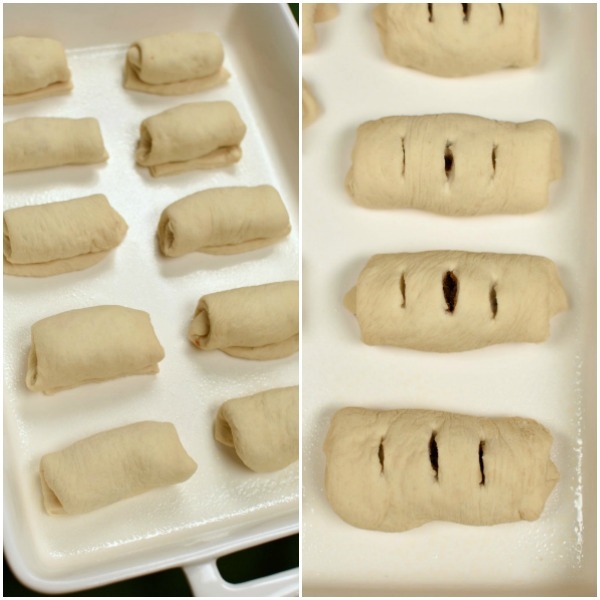 Then roll pastry up as tight as you can. Set the pastry on a parchment lined baking sheet seam side down. With a sharp knife or scissors snip three little vent holes in the top of the pastry. The need to be about ½ inch long. Let pastries rise until they are about doubled. Bake at 375 degrees for about 10 minutes. While they are cooling mix powdered sugar, butter, milk and almond extract together creating an icing. Start with just a little bit of milk and add more until you get desired consistency. Once pastries are cooled a bit ice the tops. Cut red cherries in half. Cut green cherries in half, then in half again creating the holly leaves. 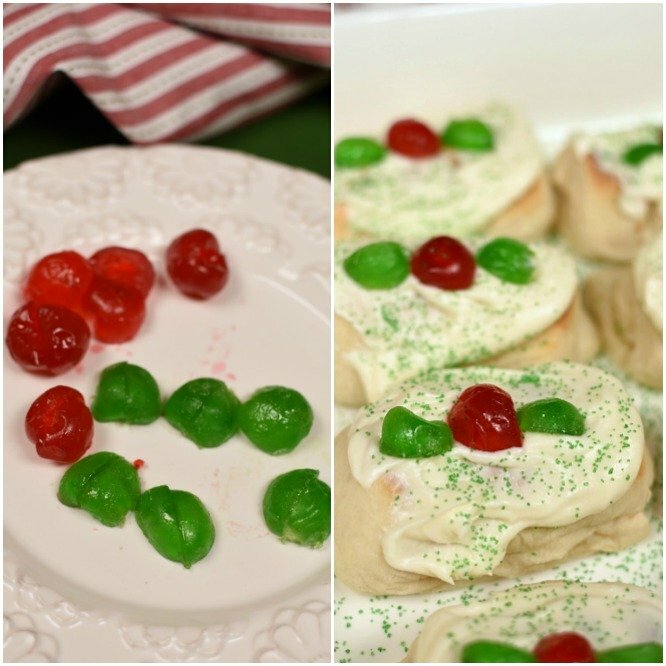 Set one half of a red cherry in the center of the pastry then add one green cherry piece on each side of the red cherry. Sprinkle with green sugar. These are best served warm. I like to microwave them for a few seconds right before serving! I told you they were easy! 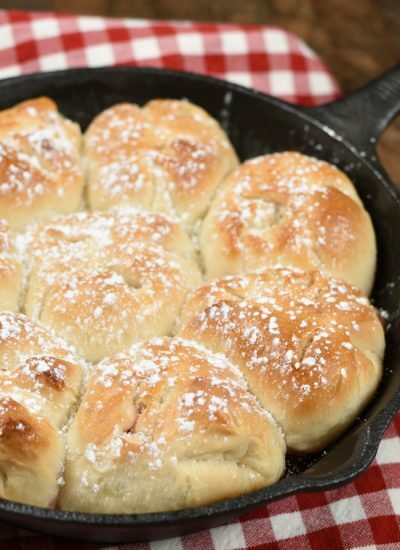 There’s nothing like getting a headstart on busy days with little time savers like Rhodes dough. It’s yummy, and so easy! You just can’t beat that! So whatever you do don’t save this recipe for another day! Get it made right now! And no matter what don’t stick your Christmas Pastries in the bottom of your underwear drawer or some other secret hiding place and save them for another day because they just don’t keep very good! And your undies would get yucky! They really are best right out of the oven! In fact, maybe you should invite some friends over to help you enjoy them! Happy Holidays everyone! May we all splurge a little and live life in the present! 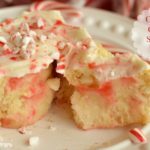 Christmas Pastries are a gorgeous and delicious Christmas bread that are easy enough that anyone can make them! They have a yummy little surprise inside that will make you fall in love with them! Let pastries rise until they are about doubled. Bake at 375 degrees for about 10-12 minutes. I’m a save the best bits for last kind of girl!! You are a girl after my own heart! It gives you something to look forward to the whole time you are inching closer to that amazing bite! Are these a semi-homemade version of your mom’s Butter Bright Pastries? I happen to be making those today! One of our all time favorites! Love your blog, thanks for sharing all your goodies! I plow right through and eat the whole thing as it comes! Haha! Yes, they are a much easier version of her pastries! 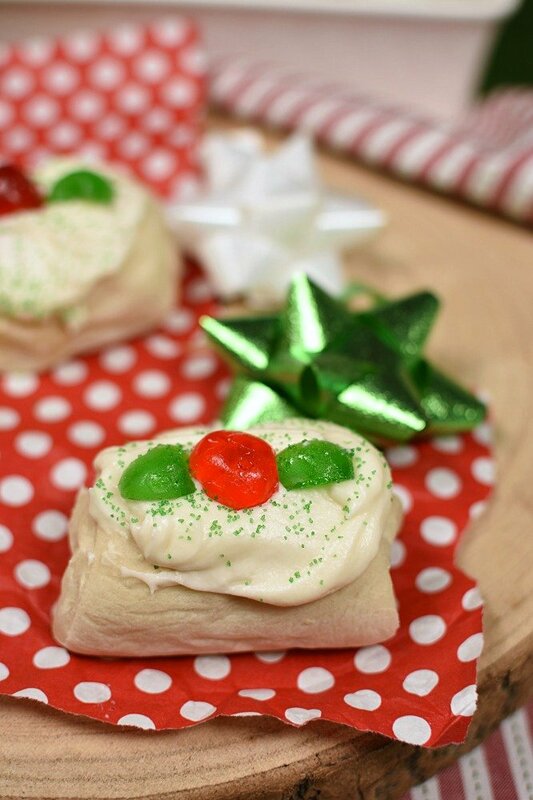 Yes, I will be making those for Christmas morning but with this semi homemade version the kids can enjoy them a few more times throughout the holidays! I’m happy you enjoy stopping by my blog! Food is always a fun way to bring us together! Thanks! Sometimes all I have time for is semi-homemade! These still taste fantastic so it’s a win win! I like your way of thinking! After the kids nestle in bed! 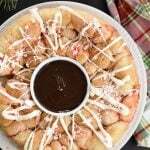 These pastries sound so easy to make, perfect for the holidays season when you want to spend more time with your family and less time in the kitchen. I love being in the kitchen but sometimes I just don’t have time. It’s nice to be able to still enjoy baked goods even on busy days! This Christmas pastries looks delicious, I like the idea using store bought bread dough and then brighten up with butter and pudding mix. The glazing and cherries make it more festive. Thanks! 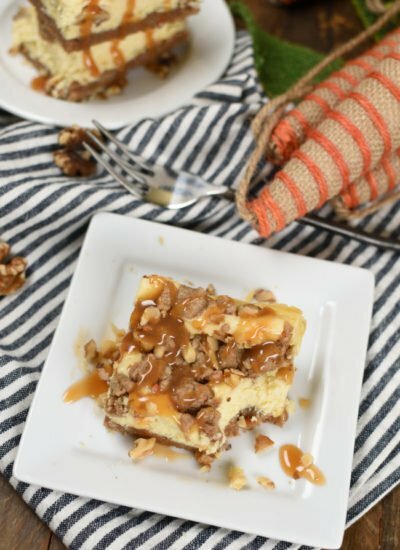 I do love having some easy recipes to pull out on those super busy holiday weeks! Looks delish! I love how festive these are! I love that they are semi-homemade! They look great! Semi-homeade saves my life sometimes! These pastries are so festive! I can’t resist festive throughout the holidays! These look totally cute and tasty. They also look easy to make so maybe kids could in baking them. Thank you for sharing the recipe. That would be so fun to get the kids in the kitchen helping with these! 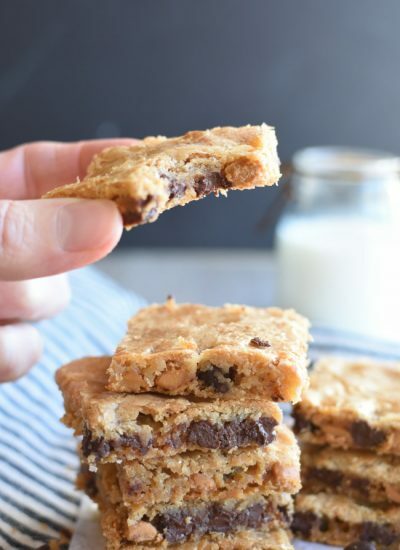 Yum — These look so good, and l love how easy they are! Those are so cute and would make great gifts! Good idea! They would be great to share with friends! Homemade pastries is a must in our house during the holiday period! I agree! I look forward to them all year! Thanks! I can’t resist festive food at the holidays!